Aikido in Fredericksburg offers twenty classes each week for adults to enable participation regardless of work schedule. 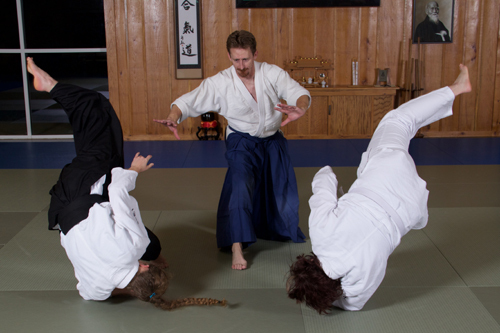 Aikido classes offer a challenging yet supportive environment for learning. Practicing with others of different backgrounds and levels of skill is part of the Aikido process. A foundation in Aikido will enhance your physical and mental well-being. Each class begins and ends with a bow. Bowing is an offering of courtesy and respect to our art’s heritage. Each student wears a white gi (uniform). Its cleanliness is a reminder to come to class with a clear mind prepared to learn. These traditions add an air of discipline and respect to our practice. Class continues with warm-up exercises. Stretches help relax and prepare the body for partner practice. Warm-ups generally end with ukemi (correct falling) including forward and backward rolls. Ukemi permits each student to practice Aikido with confidence and safety. The instructor then demonstrates a technique to be applied against a certain attack. The class divides into pairs and each partner alternates being uke and nage (attacker and defender). Both partners depend on each other to safely and smoothly complete each technique. Each person becomes conscious of their own level of ability and that of their partner, and should strive to improve that level with each class. Every class includes different techniques to give the student an opportunity to look at and assess the attack-defense experience differently. As students advance, the number of techniques, including practice with wooden sword and staff, and the level of difficulty is increased. Some would even say Aikido offers Spiritual Benefits.